After yesterday’s long discussion about transportation in the Magic Kingdom, my mind wandered to my favorite spot in World Showcase as a child: on the second level of the omnibuses that made up the World Showcase Transportation. It made me go looking for this photograph. That’s the omnibus in the background. For those who remember, these busses were quick ways to cut down on some of the walking in World Showcase. Each stop had a section of sidewalk, generally between the lagoon and a planter that could provide some shade. The route included four stops: between Mexico and China (before Norway arrived on the scene), between Italy and The American Adventure, United Kingdom, and between Canada and the main thoroughfare to Future World. I spent many an afternoon aboard one of the omnibuses waiting to jump into the perfect seat, second floor, directly in the front. 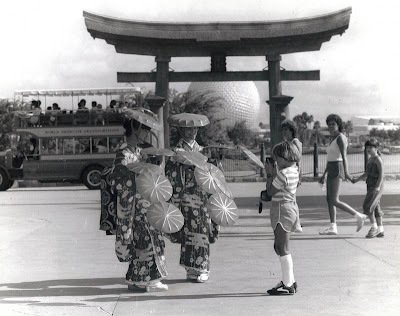 While my love of the World Showcase Transportation is what attracts me to this photograph, it was obviously created to highlight the dancers from Japan. 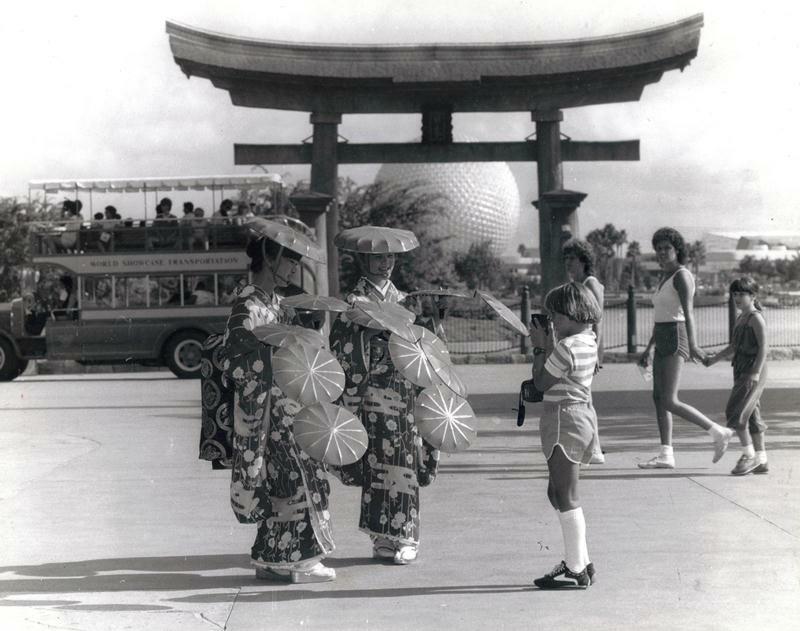 While it may seem like World Showcase has changed, and the cultural acts for each country, there are still a variety of traditional arts available on any given day throughout the pavilions. Of course, it would be remiss of me to not note the hair and clothing stylings of these 1983 guests. I mean, check out the sweet athletic socks and gym shorts on this young visitor. Or better yet, the hair of the women in the background. Ah, the 80s!